● MEP reviews of new ingredients. ● In April, EFSA’s evaluation on the essential composition of formulas will be the subject of a 6-week public consultation. The preliminary report found no evidence (or insufficient evidence) to support the inclusion of many commonly used ‘optional’ ingredients, prompting renewed calls for a ban on promotional claims. ● In February, Member States adopted an EU Action Plan on Childhood Obesity 2014-2020 5 that among other things calls for more support for breastfeeding and monitoring of the Directive 2006/141 and the International Code of Marketing of Breastmilk Substitutes. Foods for Special Medical Purposes (FSMPs) are necessary products for infants who have metabolic disorders where breastfeeding is contraindicated or where full or partial feeding with specialised formulas is needed. The number of babies needing such feeding is extremely small [globally possibly less than 25,000 babies]. Maple Syrup Disease (0.0005% of 129 million) and babies with PKU are often cited. However, even though PKU babies need a formula without phenylalanine, they benefit from the addition of partial, carefully managed breastfeeding as do babies with other inborn errors of metabolism. ● The majority of sick babies need breastfeeding or donor human milk. However they are fed, all babies and especially sick babies, need the protection of the International Code of Marketing of Breast-milk Substitutes and WHA Resolutions. ● FSMPs are often the sole food for children at a vulnerable stage of growth and development when the energy and nutrient intake per kilo bodyweight is greater. Their manufacturing and marketing requires more - not less - care. ● The EU Commission now acknowledges that the exploitation of its lax rules has led to a growth in the market for products claiming to be FSMPs. Many of these products are simply avoiding composition and other safeguards, such as the legal requirement for a ‘breastfeeding is best’ statement. Many contain thickeners and other ingredients that would not otherwise be permitted. ● There is limited evidence of efficacy for many of the products claiming to be FSMPs. Many are more expensive than standard formulas. Many carry highly promotional, misleading and unsubstantiated claims and brand names, such as Staydown, Anti-Reflux, Comfort, Easy Digest, that medicalise common feeding occurences. 1 Widen the scope of the EU Directive on infant formulas and follow-on formulas (2006/141)8 to include FSMPs for infants and young children.Grouping FSMPs with standard formulas, possibly as a Section B, as is the case with the Codex standard, 9 would facilitate the inclusion of much-needed safeguards and aid harmonisation of export rules. 2 Whatever decision is taken, and even if the misclassification of FSMPs is addressed, all the safeguards of the International Code of Marketing of Breastmilk Substitutes and subsequent, relevant WHA Resolutions should apply to FSMPs for infants and young children. 5 FSMPs for infants and young children that are fed orally must carry all the warnings and notices required by the International Code regarding the superiority of breastfeeding and risks of artificial feeding, alongside the necessary precautions, known side-effects, contraindications, product-drug interactions, and alongside appropriate information about the correct use of the product. The argument that including the breastfeeding statement poses risks to health is not valid in the vast majority of cases. 6 FSMP labelling and information should state that products should only be used on advice of health care professionals who are free commercial product influence. 7 FSMP labelling and information should not carry nutrition, health or disease risk reduction claims, but should carry clear information regarding their appropriate use. 8 FSMP labelling and information should have no pictures of infants and women or pictures or text which idealize the use of the product. 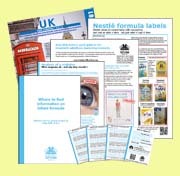 9 FSMP labelling and information should avoid any risk of confusion between infant formula, follow-up formula, and formulas for special medical purposes. 10 FSMP labelling and information for powdered formulas should carry the preparation instructions recommended by the WHO/FAO.9 (Many FSMPs do not recommend reconstitution with water at 700). 11All the above requirements must apply to exports of FSMPs for infants and young children and the marketing practices carried out by EU-based companies in Third Countries. One thing is clear, if infant and young child health is to be protected a radical rethink and strengthening of the rules governing this sector is needed. 2 Law-makers can give the EU Commission the option to supplement or amend certain non-essential elements of the EU law or framework law by delegating authority. The Lisbon Treaty introduces delegated acts as a special category of law in addition to EU directives and regulations. Delegated acts have supremacy over national laws and national constitutions although they are to be approved in an organ where all member states are not represented. 10 FAO/WHO. 2007. Safe preparation, storage and handling of powdered infant formula: guidelines. The majority of the world’s sick babies require breastfeeding or donor human milk for survival. All babies, and especially sick babies, need the protection of the International Code of Marketing of Breast-milk Substitutes and subsequent relevant WHA Resolutions. While there may be under-reporting, the number of infants with metabolic disorders where breastfeeding is contraindicated or where full or partial feeding with specialised formulas is needed is extremely small, [globally possibly less than 25,000 babies]. . Maple Syrup Disease (0.0005% of 129 million) and babies with PKU are often cited. However, even though PKU babies need a formula without phenylalanine, they benefit from the addition of partial, carefully managed breastfeeding as do babies with other inborn errors of metabolism. Since the adoption of the 1999/21/EC Directive there has been exploitation of the lax rules and a subsequent growth in the EU (and export) market for FSMPs. Manufacturers are misclassifying products as FSMPs in order to market ingredients such as thickeners that are not allowed in infant formulae. By doing so they avoid the legal requirement for a ‘breastfeeding is best’ statement, warnings and others marketing controls. The products invariably carry highly promotional and unsubstantiated claims unrelated to any specific function. The EU Council, Parliament and Commission have acknowledged that FSMPs for infants should be subject to additional specific rules in addition to compositional requirements. What these rules should be is not yet decided. If infant and young child health is to be protected there needs to be a radical rethink and strengthening of the rules governing this sector. • FSMPs for infants and young children are often the sole food for children at a vulnerable stage of growth and development when there is a need for increased energy and nutrient intake per kilo bodyweight. The manufacturing and marketing of FSMPs requires special care. Widening the scope of the 2006/141 Directive on infant formulas and follow-on formulas to include FSMPs for infants would facilitate the implementation of much needed safeguards. FSMPs are included in the Codex standard for Infant formula for this reason. This would also assist harmonisation in relation to exports. • Whatever decision is taken, and even if the misclassification of MSMPs is addressed, all the safeguards of the International Code of Marketing of Breast-milk Substitutes and subsequent relevant WHA Resolutions should apply to FSMPs (and other products) for infants and young children. • FSMPs for infants and young children should only be available on prescription in order to avoid needless use and mis-use. • FSMPs for infants and young children that are fed orally must carry all the warnings and notices required by the International Code regarding the superiority of breastfeeding and risks of artificial feeding, alongside the necessary precautions, known side effects, contraindications, product-drug interactions, and alongside appropriate information about the correct use of the product. Several Member States seem to require this already. • The labels on FSMPs for infants and young children should state that the products should only be used on the advice of an independent health care professional as to the need for its use and the proper method of use. • FSMPs for infants and young children should not carry nutrition, health or disease risk reduction claims, but should carry clear information regarding their appropriate use. • The labels of FSMPs for infants and young children should have no pictures of infants and women or pictures or text which idealize the use of the product. • Labels of FSMPs for infants and young children should avoid any risk of confusion between infant formula, follow-up formula, and formulas for special medical purposes. • All the above requirements must apply to exports of FSMPs for infants and young children and the marketing practices carried out by EU-based companies in Third Countries. 4 In Germany, where screening for such conditions is more common, the incidence of PKU 1 in 10,000 , Galactosaemia 1 in 35,000 and Maple Syrup Urine Disease 1 in 200,000. Extrapolating from these figures to the whole world, it is likely that 18,428 babies are born with PKU, 3,685 with Galactosaemia and 645 with Maple Syrup Disease – a total of 22,758 each year. There may be other even rarer conditions where breastfeeding could be contraindicated. 9 FAO/WHO. 2007. Safe preparation, storage and handling of powdered infant formula: guidelines.